When Archer debuted in 2009 on FX, the surly, titular character made waves on cable TV – becoming an instant classic. Its widespread popularity was also bolstered by the streaming service Netflix, where it found an even greater audience in the ensuing years. After a series of evolutions (with steep departures like Archer Vice) our favorite alcoholic spy returns with his most recent iteration Archer: Danger Island – a pulpy, retro adventure set on a mysterious Pacific Island in the 1930s. So, six episodes in – how is the show’s ninth season? In short: quite impressive. The evolution of Archer started way back in season five, when the series graduated from an adventure-of-the-week spy comedy to an arc-driven spoof of Miami Vice – aptly titled Archer Vice. While Season 6 (somewhat) reverted back to its former components of espionage and counter-intelligence, the Season 7 finale “Deadly Velvet” brought the biggest game-changer yet – a near fatal shooting that puts Sterling Archer into an indefinite coma. As a result, we’ve spent two seasons in his dreamscape – first with Archer: Dreamland and now with Archer: Danger Island. While these dream seasons strip away tangible stakes for the characters, they also provide rich new environments where the spirit of Archer can live on in different time periods (and with different eclectic stylings). And while Dreamland struggled with such creative liberties, Danger Island seems to have cracked the code. “Last season, we loved it, but things got pretty dark, pretty fast” producer Matt Thompson said at last year’s Comic-Con, referring to Season 8’s violent and brutal noir tone. “Adam Reed has been talking about doing something fun and just having a blast this season.” And that they did: Nazis, dogfights, wartime paranoia, mystic artifacts, talking parrots, and a swashbuckling pilot duo, Danger Island hearkens back to 1930s adventure serials – some of the most seminal properties in modern Hollywood storytelling. It’s a welcome return to form after the abnormally dour Dreamland. Thankfully, Reed’s newfound health and happiness shines through in every frame of Danger Island (of which he is the sole writer). The animation is more stunning than ever before. The richness of the colors, textures, and details breathe a freshness into the frame – an oceanic bliss that transports you to Danger Island itself. It’s staggering to see how far the animation has come in just eight years (from a style that was barely superior to early South Park seasons). There’s a quixotic passion and romanticism about the revamped characters and their setting. More than ever before, you want to leap through the screen and join the misfit crew in their larger-than-life adventures. Ultimately, everything you need from a good season of Archer is here to be found. The character relationships and vulgar idiosyncrasies are recalibrated for the 1930s, but are still just as hilarious, insane, and strangely heartfelt as they are in “reality.” The stories are constructed for maximum dramatic impact, and purpose to use every character in a meaningful and innovative way. Its leisure pace is oddly endearing, and its lunacy – like the prehistoric lizards and human cannibals – strike a deliciously campy and magically realistic balance. The show does lose some points for its occasional lack of narrative clarity and over-reliance on cringe-inducing humor that brushes shoulders with its more genuine moments – but when it flies, it soars, and it’s a ride you’re in no rush to get off of. 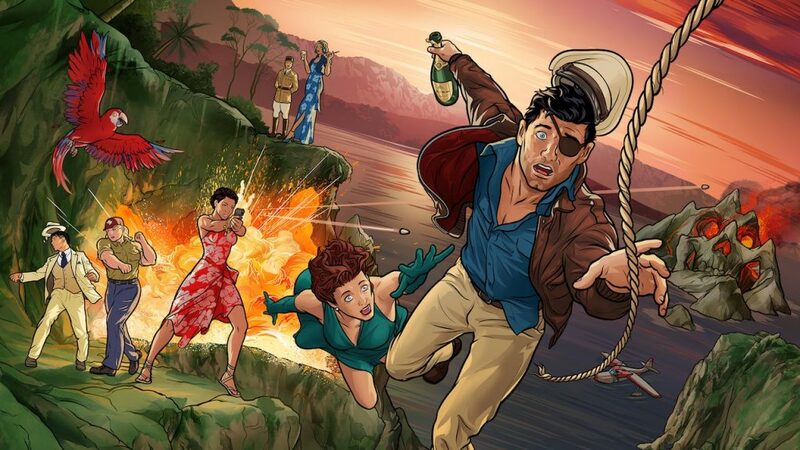 Danger Island isn’t the pinnacle of the Archer series, but it’s a breezy, charismatic and worthy rendition of our favorite characters – and unlike some of the other experimental seasons, a pleasure and not a chore. Archer: Danger Island airs every Wednesday at 10 PM on FXX. Adam Barnard is freelance writer currently living in Orange, California.